HomeBlogLatest NewsLaying Buffalo Turf in Winter, Is it Possible? In gardening folklore, there’s a belief that all planting should be done during Spring. There are valid reasons for this as far as lots of plants go, but the good news is that in Australia, turf can be laid at any time of the year. Often the most overlooked component of a great lawn is making the ideal choice of turf for your regional climate or prevailing conditions at your location. There is a huge variety of turf available these days and many have been developed with different climates in mind. In most Australian residential areas, Buffalo varieties are a popular choice and they work well. Not only are they hearty, but they have a pleasing, lush colour. They grow well in the shade, which means you can have trees and shrubs around your lawn. Buffalo turf is easy to maintain, too. However, in hot, humid areas, like the northern parts of Queensland for example, you might be wise to consider Zoysia because it copes better in the heat than other varieties. Couch also grows well in large, sunny areas and it is usually chosen for large public spaces like sports fields, parks and golf courses for this reason. In colder climates and areas affected by winter frost, like Canberra, Tasmania and Victoria, a particular type of Buffalo called the Palmetto Buffalo is an ideal choice because it will tolerate frosts and it also manages to keep its bright colour in the winter months. Preparation is the key to a great lawn at any time of the year, but in winter you need to be particularly vigilant about removing weeds from the vacant lawn bed. The reason is that the lawn will be slow to establish. Weeds, on the other hand, thrive at all times of the year. If laid during winter, your new lawn will find it harder to establish if there’s lots of competition from weeds for water and soil nutrients. When your yard is weed-free, put down a coarse layer of sand and cover that with a generous layer of top quality soil. A good amount will give your turf a terrific start, which is especially important in the winter. While the turf is not at risk of drying out as quickly in the winter as in summer, it’s still essential to get it laid as soon as possible after delivery, ideally the same day. Leaving it out can adversely affect its ability to establish. 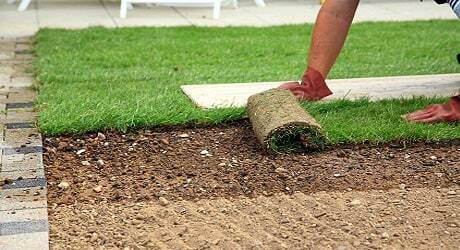 In winter, turf will take longer to ‘settle in’ and grow a strong, healthy root bed. In the warm summer months a new lawn takes about two weeks to really ‘bed in’ and for the roots to take hold. In cooler weather, you can expect turf to take much longer, typically 4-6 weeks, simply because the growth cycle is always slower in the cooler months. During the establishment phase, ‘fence off’ the new lawn. Foot traffic, pets and using garden furniture during the early stages can all damage your lawn at a time when its self-repair is not as resilient as in warmer months. Water any new lawn daily for the first four to six weeks. This is critical in both summer and winter. And it’s important to water early in the morning or in the evening to avoid evaporation and make the most of the moisture’s effect on root establishment. To be sure you’re using enough water, a good tip is to put an empty container on the lawn – an old ice cream container or plastic bucket will do – and just water over it, as you are watering the lawn. When the container is about a centimetre full in the base, your lawn has been sufficiency watered. Using a good all round fertiliser like Seasol during the first few weeks will also help give your winter lawn a great start. Keep dosing the lawn regularly through Spring too, according to the recommended guidelines, so the lawn is in great shape by the time Summer comes around. And don’t be in a hurry to mow the lawn. A new lawn should have a good-sized growth before you mow for the first time, about six weeks is ideal. Light frost won’t kill the grass, even in its infancy. But it’s important to realise that while frost is actually water, it should not be considered part of your daily dose because it only sits on the top of the blades, evaporating in the sun. In the first weeks of establishment, it’s important that water gets to the roots of the grass daily, to help them bed firmly into the soil. Planning a new lawn this winter? So there you have it, provided you choose the right turf for the environment you’re in and also take some seasonal precautions, there’s no reason you can’t successfully lay turf in the winter. Talk to us for more advice, or to find out the best turf variety to use at your property. Phone us for a quote on (02) 9119 1101 or send your details to us online, for a quick reply.